1. Making a new dolly. So utterly satisfying when I was stuffing the little limbs. I don't know why, but it is. 2. Watching Bill Cunningham, New York on netflix. This octogenarian cool hunter is such a lovely, enlightened being. Watch it. 3. Making a kale dish that everyone went yum yum for by transforming a Canadian Living recipe from swiss chard. Who doesn't like frazzled onions? 4. the sun coming up all rosy and pearly over the bay this morning. I never get tired of that. Thanks my deario! Truthfully, that film on Bill kept me from going to a very dark place a few weeks back. Lovely human. You are so very talented, Jan!!! I love that dolly! My friend had made a doll that looked like Frida Kahlo and I loved it. 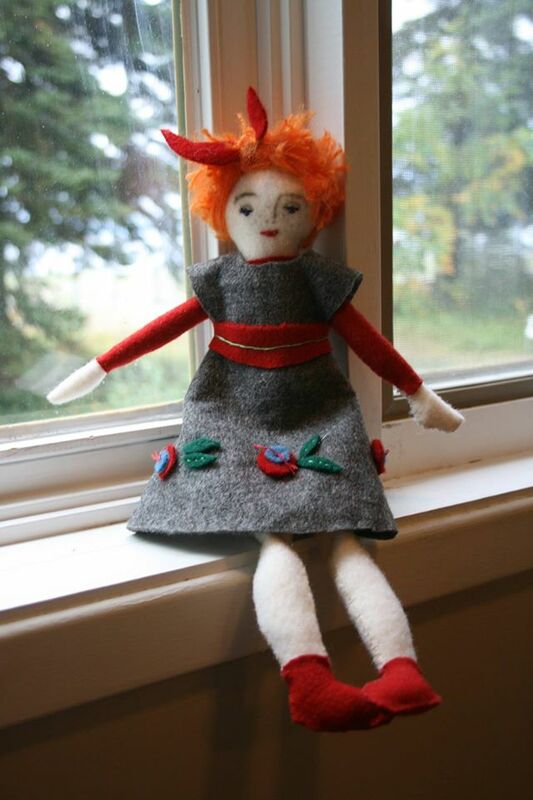 After my mom passed away, I asked my friend to make a doll with Mom's physical characteristics. It's something that, while others may find it a bit creepy, I find heartwarming to hold tightly to my bosom upon occasion and think of Mom with affection and longing. Is that weird? I don't think so, and don't care if it is.